Well... our family camps all summer and next spring we'll do our first backpacking trip with our then 10, 8 & 6 year old. We're so excited! My 5 year old daughter's on my lap while I'm reading your blog and she's like "that's cool" about your overnight camping. She likes the map too! We're camping this weekend for the Common Ground Fair in Maine. Can't wait to post the photos and write a post next week. It's the best organic/folkie/sustainable culture country fair in the country! i think the last time i went camping was back in grade school / elementary. :) boy scout then. :) long time ago. i was a kid the last time i went camping. i have a fear of sweating. and bugs, snakes, spiders, bears, and mountain lions. thankfully, everyone doesn't have my issues. how about never! i really would like to though. my last camping trip when i was a kid was the worse ever and I haven't been since. but i need to change that. especially after reading about your adventures! 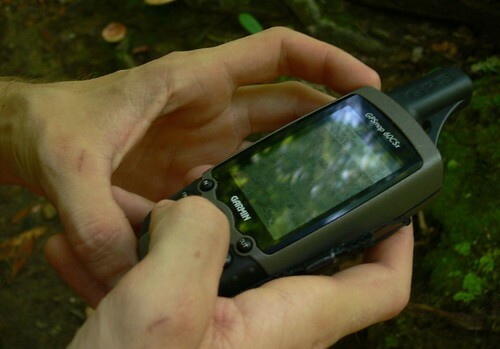 Great shots from your hike. 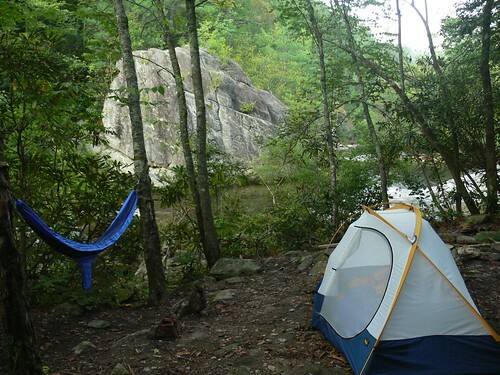 I have spent many a happy time hiking and camping in the Pisgah National Forest. 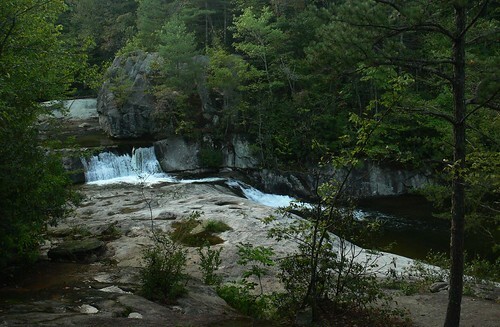 My last moutain hike was in October 2007 at Peaks of Otter in Virginia, we stayed in Bedford, VA and did day hikes. Usually we go twice a year. 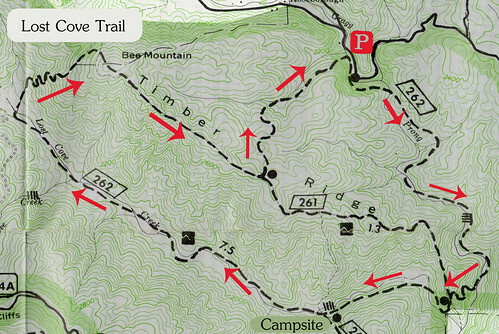 We hiked in the Pisgah National Forest in May of 2007. We stayed in Blowing Rock for that trip doing day hikes. I used to always camp and that was the first thing my ex-husband (currently close friend) did together before we were a couple. I had camping buddies who I went to the NC mountains frequently with starting in 1975 and then Bill joined us in 1977. He proposed to me on a camping trip outside of Asheville. When Bill and I had our daughter in 1985 we camped less until she was about 5. Then after about 1997 when I turned 40, I'll admit I got to preferring beds (easier on the back) and day hikes. So that's my long winded answer to your question. I used to have a fantasy about building up to back packing on the appalachian trail and walking from Georgia to Maine after I retired in my 60s but I have to admit that will probably stay in fantasy land. I love your waterfall pic! We took our boys camping for the first time this summer, and it was a disappointment. They are wimps about being in nature, so we played it too safe and went to one of those places that's like camping in a parking lot of RV's. Oh well, the boys did better than we thought they would, so we're going for something more scenic next summer. I’m playing catch up this morning after a BUSY few days! I loved the effects in your Weekend Reflection and enjoyed the Haiku too. Glad you ‘got away’ for a while. Your ‘We Heart Mountains’ is simply MARVELOUS! I enjoyed reading about your backpacking trip (a couple of those photos were AMAZING) and found myself thinking it’s been way too long since I’ve visited the mountains. I'm almost wordless at Sacred Ruminations and have shared 'goodies' to 'snag and share' at Small Reflections. Um, last time was 5 years ago. I'm so wasting my life. It's been a while for me. Maybe I will write the story of the last camping trip sometime on my blog. We never had much luck camping. I think I have a camping curse or something. What lovely photos...we love to camp too! We went to Red River Gorge, in southern KY this summer. Sounds like a relaxing weekend, breathing fresh air! We went to Yosemite this summer with my husband & two daughters (ages 2&3) It was their first time & they loved it. I'm not sure what they'll think if we camp where there isn't a place to buy ice cream. 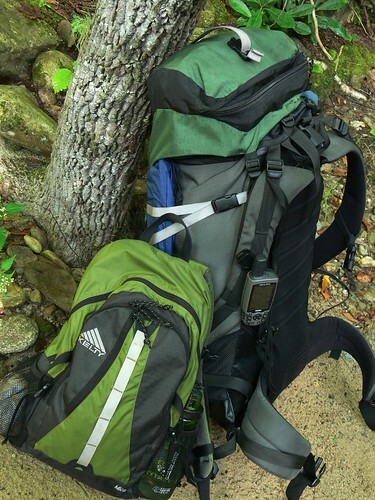 I haven't backpacked in about 4 years. I think that was a Yosemite trip too. i haven't been camping in years and years and while i do hike, it's usually just for a few hours. i wouldn't even know where to begin to start! but your pictures, as always, are breathtaking. Your pics make me want to camp now. It looks very beautiful. The last time I camped was quit a few years ago. The trip was a disaster, the car broke down and we ended up in an over crowed caravan park next to a smelly dumpster, couldn’t get the car fixed quick enough and get out of there. if it wasn't for my legs i'd love to do a trail.but those days are gone. enjoy. go at a snail's pace always smell the air and dip your feet in the stream.and don't step on the snake's .glad you enjoyed the weekend.you got a good one in Cody.Don't forget he has the last word and that is yes dear. 4.5 years ago. In Canada's beautiful Yukon, a place called Five Mile Lake which is just north of Mayo which is just south of Dawson City where I was staying with friends. Land of the midnight sun makes camping easy, you don't need flashlights. Always a great time. I'm a very good and happy camper! It's been TOO LONG since I've backpacked but seeing your photos makes me want to hop in the car this minute. 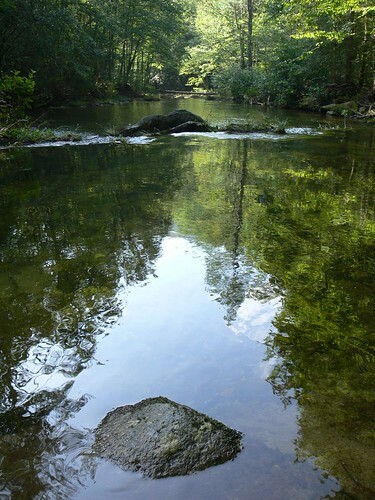 Beautiful images of the creek. I especially like the one with the rock in the foreground and the gorgeous reflection. I just got back from camping in Boone, NC last weekend and just happened upon your site this past Monday - what a coincidence. Had such a great weekend up along the Blue Ridge Parkway. I grew up camping with my family and started taking my daughter when she was about 4 - she is now 18. There is nothing better. So many wonderful memories of camping trips. My last time camping, a long time ago, was a backpacking trip with two guys: my live-in boyfriend at the time and the best friend of my ex-husband who was by then becoming a good friend of my boyfriend. Confused? We were out of control, hiking until way past dark until finally setting up our tents at a clearing. Upon waking in the morning the mountain called Three-Fingered Jack was looming in front of us, and two feet away from our tents was a sign that said: "Viewpoint. Absolutely No Camping!" This is a sore point at the moment, as my trek through Egypt has been cancelled by the organisers. I'm gutted!!! It has been over two years since my last proper trek (even before I started my blog), as last year I was recovering from my fall. So, next year I am definitely going on a proper trek with proper camping and proper creepy crawlies and spooky sounds in the night...lol! I want to LIVE AGAIN!!!!! Your post is totally mesmorising. I can almost feel the breeze and hear the rush of the falls as I read your words. Thank you so much for sharing this trip with us and thank you for being you!!!!! !